FCKeditor is a third party rich text editor (WYSIWYG) that can be used instead of the HTML TextArea control. FCKeditor provides powerful visual text editing functionality for your pages. FCKeditor installation file as well as FCKeditor documentation can be found at the FCKeditor website. There are two common methods of installing FCKeditor for use in CCS projects. The simplest way is to copy FCKeditor files directly to your project folder on the server. In this case you do not need to publish FCKeditor files when publishing your CCS project. Another method is to copy FCKeditor files to a sub-folder of your CCS project. In this case you need to configure your project publishing settings so that FCKeditor files will be published to the server. Open CCS project settings and on the Publishing tab select "All files with extensions", then add all of FCKeditor file extensions to the list. The downside to this method is that publishing FCKeditor files will increase project publishing time. 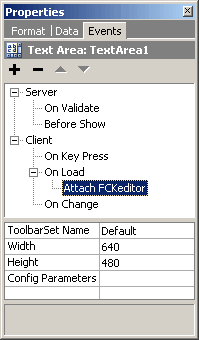 In CCS the FCKeditor can be used by selecting it from the Forms tab of the Toolbox. 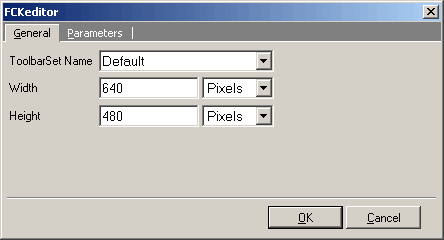 When selected, the FCKeditor configuration dialog will appear as shown below. The options shown in the dialog are same as in the Attach FCKeditor action, which is automatically added the On Load client event of the TextArea control created at the same time. Selecting this action exposes FCKeditor parameters configured via the above dialog where you can further modify them as needed. As you may suspect, you could also add FCKeditor to your page by manually attaching the Attach FCKeditor action to the On Load client event of an existing TextArea and configuring it. If you use Java, you should modify common classes after installing FCKeditor because the file information about FCK connector servlets, their parameters and servlet mapping are to be specified in web.xml file. Add the code below to server side classpath. Runtime libraries can be used for this project property.